It was billed as a Sarasota County Commission discussion about the sale of surplus property. What it evolved into was an admonishment that staff not engage in another master facilities plan for the county that would include outside consultants and lots of taxpayer expense. However, the commission on Aug. 20 did give County Administrator Randall Reid and staff approval for an update of the current county facilities plan and for Reid to meet with Sheriff Tom Knight to discuss possible Sheriff’s Office use for property adjacent to the planned county Emergency Operations Center at 1301 Cattlemen Road. After almost an hour of discussion during the Aug. 20 budget workshop, the commission voted unanimously for staff to proceed with the demolition of two buildings on a 2.2-acre county-owned parcel at 1301 Cattlemen Road and to rezone that parcel for commercial office or industrial use. David Cash, the county’s director of operations and maintenance/facilities, explained that his staff was working to finalize a list of about a dozen county properties that the commission could approve as surplus, for future sale. Undertaking the necessary due diligence on the properties, Cash said, probably would take until October or November. 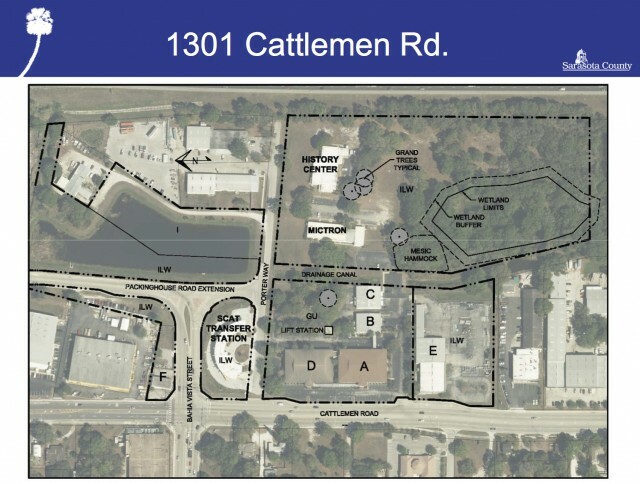 However, he pointed out that two buildings on the 1301 Cattlemen site were vacated in January and had been prepared for demolition, with that cost already included in the county budget. A local firm had appraised the parcel at $490,000, he added, net the cost of the demolition. The appraiser had said the site could be rezoned to Industrial Light Warehouse, which would allow for either office or industrial use, Cash added. Although the site has several other county buildings on it, Commissioner Joe Barbetta pointd out, “All I’ve been asking for in the last two-and-a-half years is the feasibility of selling just this piece,” referring to the 2.2-acre section Cash had referenced. Barbetta estimated the parcel had 90,000 square feet of usable property. “The market demand for new office space is still low,” Cash said, particularly in that area. However, he pinted out, the commission could delay putting the parcel on the market. Reid responded that staff did not have a master plan for the site. Nonetheless, he said, Knight had indicated that the parcel might be a good location for Sheriff’s Office space. Patterson ended up making the motion to have the buildings demolished on the 1301 Cattlemen Road site and to rezone the parcel to ILW. Thaxton seconded the motion, which passed unanimously. Barbetta said he would have preferred the motion include an authorization that the site be listed as surplus and put up for sale, “but I understand I don’t have the votes. For example, Robinson said, the sheriff was undertaking a jail population study, the results of which would be weighed in decisions about constructing a new jail. “I think we’ve got to be very careful with where we’re going with a facilities master plan … with the correct public input,” she added. Cash replied that staff was updating that plan, which was completed in 2008. The update should be complete within 10 months, Cash said. Cash added, however, that his staff was taking county employment into consideration. “That’s gone down the past four years,” Barbetta said. “It has gone down,” Cash said, but staff was looking long-range for the update. “I won’t support a huge expenditure on a master plan, either,” Patterson told Cash. Patterson was elected to her fourth term in 2010. Thaxton agreed that while he, Patterson and Barbetta had seen “various iterations” of master planning over the past 10 years, he also agreed with Robinson about not rushing into a decision on the future of the Cattlemen property. Reid pointed out, “The board needs to ensure that we can have input from the constitutional officers,” regarding whether they would be interested in facilities in the proximity of the new EOC. Thaxton said he felt Deputy County Administrator Bill Little, Public Works Director James K. Harriott Jr., Fire Department Chief and Emergency Services Director Mike Tobias and Knight were capable of handling a planning initiative for the site. Thaxton proposed a second motion, calling for staff to come back to the board with an emergency operations plan for the Cattlemen property. Commissioner Carolyn Mason seconded the motion. However, Patterson objected, calling the motion too narrow. Thaxton replied, “It was deliberately narrow.” He just wanted to make sure the property was not needed for any ancillary uses to the EOC before the board voted to put a parcel on the market, he said. Robinson agreed with Patterson. Then Mason said she also would not vote for the site plan. “I’m assuming that we can have a new discussion on the bones of updating the master plan before we have to make the decision on sale vs. not sale,” Patterson said. “Let’s get off dead center and give Mr. Reid the go-ahead to do the update and discussion [with the sheriff],” Patterson added. “Presumably, it’s going to come back to us within six months,” she said, because she would object to the process taking a year or two. Thaxton then withdrew his motion.